Hi everyone and happiest of 2014s to you all. Here are a bunch of movies that I saw in 2013 that I really enjoyed. 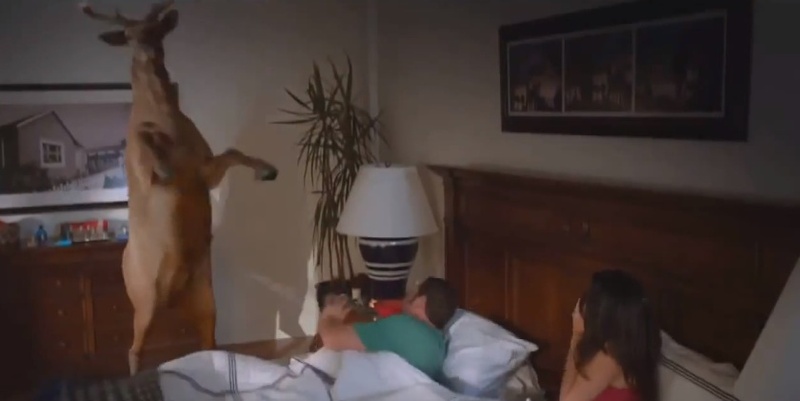 Grown Ups 2 when Adam Sandler and Salma Hayek get peed on in bed by a frightened deer in the first scene. The deer pees in his mouth. It is by far the funniest scene in the whole movie, and a definite low point in that CGI deer’s life. Anyway, let me know what I missed! Best to you all! I thought Her was pretty fabulous all around. American Hustle was crazy fun but a mite long. Gravity was an amazing cinematic achievement in terms of directing, but the script wasn’t as impressive. But s, bullock’s abs were. So many more I need to see! All in all, a good year for movies. I only go see movies I pretty much know I’m going to like so I doubt I saw even ten (non-old) movies this year but they’re, uh, all on my top ten! Loved American Hustle, Before Midnight, really liked Inside Llewyn Davis and had a fun time at Hunger Games II: I Could Eat. Was prepared to hate Frances Ha but didn’t for some reason, possibly that I watched it on my phone and they were all annoying but so tiny. Still want to see In a World… and Gravity when I can see it on a small screen because even the preview freaked me out. Three of the nominated documentaries are available streaming on Netflix, btw. So anyway I didn’t see anything you didn’t see except oh maybe Blue Jasmine which was an ok movie around a great performance, but my favorite thing I did see was Road House, not the Patrick Swayze one but the film noir starring Ida Lupino. I actually think as of today, all of the documentaries except 20 Feet From Stardom are on Netflix (they added The Square). Saw Enough Said last night as well. It was sweet. Did anyone else find Inside Llewyn Davis to be basically the male version of Frances Ha–plot, character, and cinematography-wise? I liked them both okay, but they felt like the His-n-Hers versions of the same movie to me. I liked This Is the End or whatever it was called, and Pacific Rim. Probably didn’t see ten new movies. Oh, actually, the most amazing new movie I saw this year was The Act of Killing. Unbelievable. It’s up for Best Documentary, and rightly so — probably the best documentary I’ve seen since Darwin’s Nightmare, which was like 10 years ago. Is Enough Said the new Holofcener? I generally love her films and do not know why I didn’t end up seeing it. Will you love me less if I used that joke somewhere else but used it again hoping someone would react? I just watched Dirty Wars on Netflix and it’s chilling but also made in a self-indulgent way that weakens it as a film. I was just talking to someone abt that, GF — I saw the film in Beirut w/ Scahill on hand to preach afterwards. The film was intense but the narrative frame really undercut it. Still, mad props for the grunt work involved. Jeez. And I’m still a little sick to my stomach thinking about the world we live in — and how American policy/action helps sustain it. I didn’t see that many films this year, but I did watch this one on a plane recently. Recommended if you can find it. Also really liked this one, which is on Netflix, if you want something quirky, romantic, and visually rich. Made me want to go to Buenos Aires. Also, the funniest thing I saw this year, and all the more enjoyable because I saw it with FF.